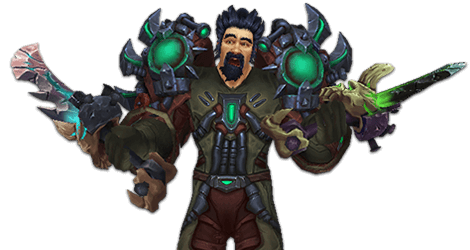 Early access to the new Demon Hunter class will be available starting August 9 to those who have pre-purchased the Legion expansion and have at least one level 70 character on their realm. To help you prepare for your new role as one of the Illidari, we’ve sent scouts into Mardum to learn more about this powerful hero. To begin your training, Game Designers Eric Maloof and Graham Berger team up to take you through the features of the Demon Hunter in this class preview video. One of the newest recruits to the Illidari, you’ll begin your journey at level 98 in demon infested Mardum. As you make your way through this dangerous land, you’ll begin to learn the skills of a Demon Hunter, their history, and become proficient in harnessing the power that goes along with your chosen path. Be warned – not every Illidari makes it through. Ask yourself this question —What are you willing to sacrifice to save Azeroth from the Burning Legion? Before you make your character, you’ll need to know a little bit more about the requirements for unlocking this hero class. In order to create a Demon Hunter, you’ll need to have at least one level 70 character on your realm. You’ll also have the option to choose between two races: Night Elf or Blood Elf. To take part in the early access period for the Demon Hunter, you’ll also want to pre-purchase the Legion expansion. Everyone who purchases the expansion after it launches on August 30 will also gain access to the class. Spectral Sight: Demon Hunters’ blindness belies their true powers of perception. They rely on magically augmented sight to detect enemies—even those that hide behind obstacles. Metamorphosis: Demon Hunters transform into hellish forms, enhancing their formidable powers. Damage-focused Illidari gain incredible swiftness and damage allowing them to finish their prey, while those who prize defense become nigh invincible in their demonic forms. Demon Hunters also possess supernatural mobility: They can double-jump, vault in and out of combat, and even glide with their wings unfurled to unexpectedly descend upon their prey and surprise enemies from above. Learn even more about the Demon Hunter by watching the Developer Q&A Part 1 and Part 2 with Senior Game Designer Jonathan LeCraft. You are now a little more prepared to be the hero Azeroth needs against the Burning Legion. Good luck on the battlefield—even with such power at your disposal, you’re going to need it.